What is the difference between Native Barcode Generators and Barcode Fonts? I am considering purchasing a product to generate barcodes. However, I see that you have products called Native Generators. What is it exactly? Is it still a font? Why would I purchase it over a font? I am confused. When you consider the types of barcodes,standards, and products that can be used to generate a barcode, it can be confusing. Actually, very confusing. A majority of barcodes that you see on items are generated using a barcode font or a barcode image product. In an older post, I explain the Difference between Barcode Fonts and Barcode Images. In this post, I will introduce a third method that can be used to generate barcodes. IDAutomation has developed a new barcode technology that allows the user to generate barcodes without using a barcode font or image generation product/component; it is the Native Generator. WHAT IS THE NATIVE GENERATOR? So, we know that the Native Generator is a product that generates a barcode without using a font or image product. Well, what does that mean exactly? In order to better explain it, let us use Crystal Reports as an example. 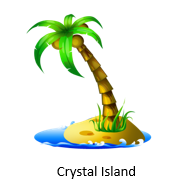 Imagine Crystal Reports as a piece of available land to build on--let's call it Crystal Island. Let us also imagine that there are two developers that want to build a house made out of barcodes on that land: (1) Barcode Font Builder and (2)Barcode Native Generator Builder. Barcode Font Builder wants to build the house quickly but needs major supplies: font encoders (to build the house) and barcode fonts (currently not available on the island). Barcode Font Builder has to contact headquarters to have barcode fonts shipped to the island. On the other hand, Barcode Native Generator Builder is prepared and has a building plan that lists all of the resources available on Crystal Island to build the barcode. This builder does not have to use any other tools or components other than the natural resources (such as system fonts like Courier New) and the building plan (equation/code) used to manipulate the resources. The Barcode Native Generator product is just like the Barcode Native Generator Builder; it simply uses the products and code native to the particular application to build the barcode. With the Native Generator for Crystal, code is inserted into the report and the barcode is built using the data passed through the code and system font, such as Courier New. Products available by IDAutomation with the name "Native Barcode Generator" or "Native Generator", then it is using patented technology (Native Generator for Access does not use patented technoogy) that generates the barcode using code/plug-in/script/vba and a system font.